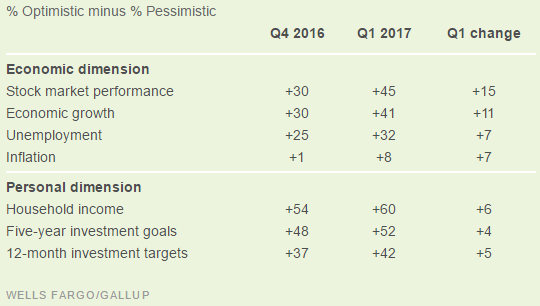 Confidence among U.S. investors remains very high, according to a new report from Wells Fargo and Gallup. 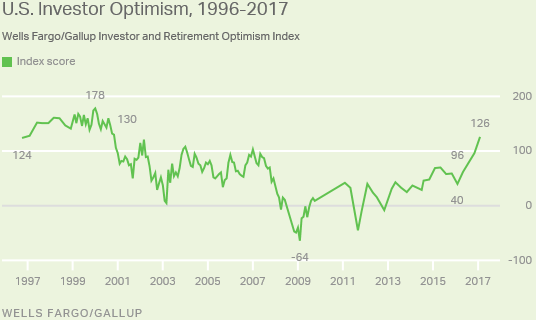 Specifically, the duo’s headline optimism index climbed to +126 in the first quarter of 2017, the best reading since the dotcom bubble. Most of the improvement in Q1 was due to respondents’ brighter overall outlook for broad U.S. issues such as economic growth, unemployment, inflation, and most importantly, stock market performance. In fact, 60 percent of surveyed investors said that they believe “now is a good time to invest in the financial markets,” up from 52 percent 2016 and the highest reading since early 2011. Expectations for better investment performance have also helped lift respondents’ general optimism about their long-term financial well-being. More than three-quarters (78 percent) of surveyed investors, for instance, said that they feel “confident” about having enough money to maintain the lifestyle they want throughout retirement, and 31 percent reported feeling “highly confident.” Similarly, only 36 percent of surveyed investors said that they consider outliving their savings in retirement to be real risk, down markedly from previous surveys. Although there are many factors that can affect retirement confidence, perhaps the most influential is having a written plan in place. Indeed, 43 percent of surveyed investors who said that they have a written plan for retirement reported being “highly confident” that they will have enough money to maintain their desired lifestyle in old age, compared to just 23 percent for investors without a written plan. Sadly, only 37 percent of non-retired investors, and just 40 percent of retired investors, said that they currently have a written financial plan. Such responses are comparable to earlier surveys and therefore suggest that little progress has been made on this front. One of the key aspects of a proper financial plan is determining the age at which you want to retire because this can have a big effect on the monthly income your savings will be able to provide in old age. More than half (54 percent) of non-retired investors in the survey said that knowing the age at which they plan to retire would likely make a difference in their current financial behavior. However, only 28 percent of these respondents reported that they have given a lot of thought to the best age to retire, and 11 percent admitted that they have given a potential retirement age no thought at all. As for surveyed investors already in retirement, 52 percent said that they wish they had started thinking about their retirement age earlier in life.